Biltmore Estate will offer a late summer treat for visitors again this year with its flower carpet. The 2010 Biltmore Flower Carpet installation will include more than 155,000 plants, covering the majority of the South Terrace. The design this year is based on a La Farge stained glass window that Mr. Vanderbilt inherited from his father. 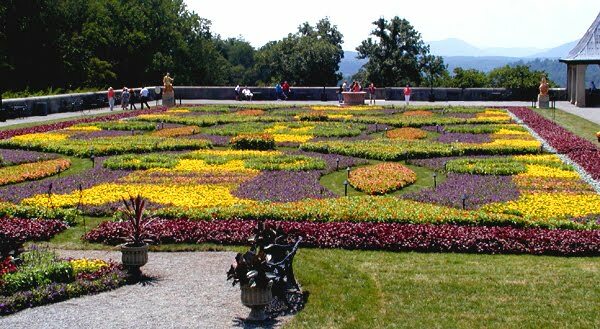 Not only can you enjoy the Flower Carpet during the day, but you also have the opportunity to view Biltmore Estate and the Flower Carpet in the evenings, complete with live jazz and candlelight, during the following Fridays and Saturdays: August 20, 21, 27, 28, September 10 and 11. Even more good news: When you stay at the Inn on Mill Creek, you can buy discounted tickets for Biltmore at $50/person (which includes access to Biltmore House, Antler Hill Village and the Winery, the Gardens and the restaurants), and you can add a Flower Carpet Evenings visit at just $10 per ticket. This upgrade allows you to visit Biltmore House for a self-guided tour between 5pm and 8pm on the night of the Flower Carpet Evening date you choose. And as always, our tickets are good for a free second day at Biltmore. Please allow 48 hours for us to process your upgrade. This entry was posted in Uncategorized and tagged Asheville, Biltmore, festivals and special events, Summer by Inn on Mill Creek. Bookmark the permalink.